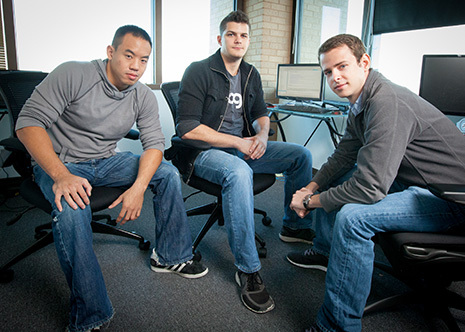 TTAGG employees include (left to right) Chuong Nguyen, Kenny Cason and Ryan Frazier. Cason, Frazier and Britt Cagnina (not pictured) co-founded TTAGG in October 2011. Photo by Russell Cothren, University of Arkansas. FAYETTEVILLE, Ark. – It started as a search for a good stock investment. TTAGG Inc. has now blossomed into a promising start-up company founded by three graduates of the University of Arkansas. Using its own algorithm, the software firm collects publicly available online comments about consumer products from across the Web and breaks down the data into market research reports. TTAGG’s clients pay a monthly subscription for access to those reports. TTAGG recently celebrated its one-year anniversary. Ryan Frazier, Britt Cagnina and Kenny Cason founded the company in October 2011. “What the algorithm does is it intelligently filters those comments looking for people who are buying things,” said Frazier, who earned a bachelor’s degree in international business and marketing in 2010. “It’s like standing in the mall all day and counting the number of people leaving each store with a shopping bag in their hand, except you’re in every mall, all over the world, counting millions of shopping bags and millions of people leaving these stores,” Frazier said. TTAGG recently hired R. Brian Henley as its non-executive chair of the board. Henley graduated from the U of A in 1986 with a bachelor’s degree in industrial engineering and he also earned a master’s in business administration from Harvard University. Henley has held several executive positions, including partner/portfolio manager with Rogge Capital Management in Austin, Texas, and chief marketing officer at Callaway Golf Co., based in Carlsbad, Calif.
Amerine teaches entrepreneurship classes in the Sam M. Walton College of Business and coached Frazier’s team in the 2009 Donald W. Reynolds Governor’s Cup, a statewide undergraduate and graduate business plan competition. Frazier, Cagnina and Cason started TTAGG in a rented house just north of the Fayetteville campus, where they also lived. Their first employee was Chuong Nguyen, another U of A graduate. The company has grown to seven employees and is now located on the fifth floor of the E.J. Ball Building in downtown Fayetteville. “We’re cash-flow positive at this point,” said Frazier, who serves as the start-up company’s chief executive officer. Cason, who graduated from U of A in 2010 with a bachelor’s degree in computer science, is a software engineer at TTAGG. He was working on missile defense software at Lockheed Martin in Washington, D.C., before joining the firm. Cagnina, who graduated with a bachelor’s degree in mathematics in 2010, is a software developer. Frazier, 24, is from Hot Springs. When he was still a student at the university, his team, SooiieeSake LLC, made the final round of the undergraduate competition at the Governor’s Cup in 2009. He served as president of the student-run collegiate chapter of the American Marketing Association and was involved in the Felix Investment Group, which he started with eight classmates in 2008. After graduating in the spring of 2010, Frazier went to work as the marketing and sales director for Sigma Supply Inc. in Hot Springs, a wholesale distribution company specializing in packaging and packaging equipment. He left that job in August 2011 to develop the launch of TTAGG, but he had the idea for the company the previous December. Based upon the online comments he read, he opted to buy stock in the clothing retailer Urban Outfitters. Three weeks later the company reported a 12-percent quarterly earnings increase. “It was pretty exciting,” Frazier said. “It basically grew from that: This idea that these people were talking about things that they were buying online, and if we grabbed all those comments we’d have a good idea for how that company was performing. We built it for the financial sector first. Now we’ve built it for market research and customer insights. Frazier said the company name is derived from metadata, embedded tidbits of information about a certain online item’s content, such as a tweet on Twitter.